Twenty four hours isn't long to spend in the City of Angels, and knowing what to do with one day in Bangkok is very challenging if you aren't familiar with getting around the city. Moreover, many of the trips advertised are actually places outside of what locals consider Bangkok; floating market, Tiger Temple, etc. So it's quite possible that taking a two hour trip somewhere will mean missing the vibe of the inner city all together. One major sight can pretty much exhaust the day, and before you know it the sun is going down and you feel like you haven't done much at all. If you're not careful you could find yourself stuck in traffic for a couple of hours in total, or spending many a frustrating moment looking at a map asking for directions. Of course, you have the choice of a city tour guide, but do you really fancy being herded around in the heat, unable to take in what you're seeing at your own leisure? I'm not a fan. 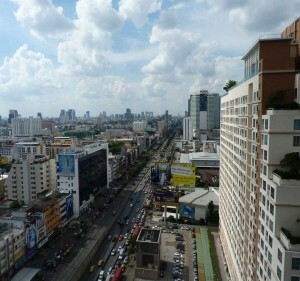 See some Thai heritage, do some shopping and enjoy some relaxation. See different aspects/areas of the city. Enjoy the day without feeling too rushed, hot and bothered. We took the MRT to Hualampong Station. From there we took a tuk-tuk to the Grand Palace. We could have got the boat but I wanted them to experience a reasonably long tuk-tuk drive. Besides, we'd be getting a boat later. We arrived at the Grand Place and did the full shebang in 1.5 hours. 350 Baht entrance fee. Remember you need trousers and a t-shirt. If not you will need to queue to hire clothes. Make sure you ignore the palace scam, too. Although to the Palace's credit there are now loud speakers to help tourists avoid the touts. 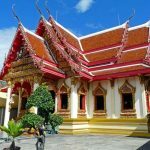 We walked left out of the main entrance of the palace, followed the wall round and along the riverfront to Wat Pho, the reclining Buddha. 100 Baht entrance fee and one hundred percent worth seeing. We ate lunch opposite the Wat Pho in a restaurant with outdoor seating. Food and prices are reasonable (Chicken Pad Thai 80 Baht). There's a selection of coffees and shakes too. I can't recall the name, but if you come out the way you went in, turn left, walk straight to the corner, turn left, walk 20 yards and cross the road, you won't miss it. After lunch we walked round to the riverfront, passed the seafood market and took a pleasant boat journey down the Chopraya to China Town (60 Baht). We took a one-hour walk around; a few pictures, bought some tea and back onto the boat. If you go on a weekend be sure to check out Klong Thom market. Side note: Before you board the boat you can buy gifts in the market; everything from mini Buddha statues to Thailand merchandise. We took the boat to Sathorn to pick up the BTS. We'd actually paid to Sathorn initially so they said we didn't have to pay again. Side note: Make sure you stand up on the boat and take in the old architecture along the riverfront. The old wooden houses and pagoda-topped dwellings will give you a sense of what the city was like many years ago. Arrived at Sathorn and took the BTS to National Stadium. Cost: 30 Baht. The Bangkok Art and Culture Center is conveniently opposite MBK, and in my personal opinion one of best hidden gems of the city. We went inside and walked around a wonderful Bangkok history exhibition. We then had an organic coffee in a quaint coffee shop on the ground floor. Entrance is FREE. No tourist's visit is complete without a visit to MBK (opposite) for some shopping. My friends bought some t-shirts, we also had a sneaky Svensons. To our pleasant surprise there was a fun fair of sorts outside MBK getting warmed up for Loy Krathong. We shot some corks out of guns, threw some tennis balls at cans and had a few laughs with the locals. We got free sweets for our participation :). We boarded the BTS back to Asok and went to Terminal 21 for some more shopping. Of course we couldn't resist a Starbucks to perk us up again. The toilets in T21 are well worth a go, too, with their automatic bottom sprays my friend's partner went twice just for kicks! We decided to eat some farang food at the outdoor Sunrise Tacos just a short walk from Asok station. The food is really good and we lounged on the sofas with cocktails and a meal until 9pm. The day was almost done, but there was still time to squeeze something else in. So we jumped into a Taxi and went to Lebua State tower to take in awesome views of the city over a few drinks. Do this, it really is a great way to end an evening. And we're done! One great day in Bangkok. A little bit of everything. Culture, relaxation, good food, different vibes…what more could you do in a day? I guess squeeze in a disco, too, but my friends had to be up at 7am to catch a flight to Phuket. 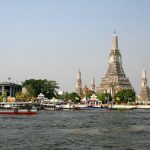 Got an itinerary for one day in Bangkok? Let me know! Hey! Great plan for a day's visit to Bangkok. Could you also suggest the locality where I could live, so access to these places is quicker and easy? Probably centrally, around the Sukhumvit area. But actually these places are spread in all corners of town, so as long as you are near a BTS or MRT station you will be able to jump on and visit these places. Thanks for the tips Indokiina! I must check out that Michelin star restaurant with Thai prices you mentioned, I hadn't heard of that.In terms of 10-20$ accommodation, I there's a place/hostel called Hi Sukhumvit on Suk 38. I haven't stayed there but my backpacker friend said it is great value. Thanks Suzie! We got off near the flower market if I remember correctly. I love Lebua but it's costly to drink there all night!